LisSyl Remote Desktops (LRD) is an easy to use and free tabbed Connection Manager. The software allows you to connect to multiple remote devices and display the sessions in tabs. LRD supports connecting via the most used protocols RDP and SSH. Your remote devices can be retrieved from Active Directory, VMware and HPE IMC. Only the current version can be downloaded. At this moment the current version is 5.1.0.0. LisSyl Remote Desktops is free software and is provided free of charge. Your donation, that is without any obligation, supports the development of the software. If you appreciate our software, we ask you to consider making a donation. Welcome to LisSyl Remote Desktops help! LisSyl Remote Desktops is a free connection manager for multiple RDP and SSH connections in a tabbed view. It supports retrieving devices from Active Directory, VMware and HPE IMC. Do not hesitate to contact us. We gratefully accept all comments and suggestions. It’s possible that suggestions will be incorporated into this program to enhance it’s features. You should carefully read the following terms and conditions before using this software. Your use, distribution, or installation of this software indicates your acceptance of this License. If you do not agree to all of the terms of this License, then do not install, distribute or use this software. This software is Freeware and may be used on any computer. You may not modify the software, nor give anyone permission to do so. THIS SOFTWARE, AND ALL ACCOMPANYING FILES, DATA AND MATERIALS, ARE DISTRIBUTED “AS IS” AND WITH NO WARRANTIES OF ANY KIND, WHETHER EXPRESS OR IMPLIED. THE USER MUST ASSUME THE ENTIRE RISK OF USING THE PROGRAM. IN NO EVENT SHALL THE AUTHOR BE LIABLE FOR ANY INCIDENTAL, CONSEQUENTIAL, OR PUNITIVE DAMAGES WHATSOEVER RELATING TO THE USE OF THIS SOFTWARE, OR TO YOUR RELATIONSHIP WITH THE AUTHOR. IN ADDITION, IN NO EVENT DOES THE AUTHOR AUTHORIZE YOU TO USE THIS SOFTWARE IN APPLICATIONS OR SYSTEMS WHERE THIS SOFTWARE’S FAILURE TO PERFORM CAN REASONABLY BE EXPECTED TO RESULT IN A SIGNIFICANT PHYSICAL INJURY, OR IN LOSS OF LIFE. ANY SUCH USE BY YOU IS ENTIRELY AT YOUR OWN RISK, AND YOU AGREE TO HOLD THE AUTHOR HARMLESS FROM ANY CLAIMS OR LOSSES RELATING TO SUCH UNAUTHORIZED USE. We will explain LisSyl Remote Desktops functions in this help by walking through all items. On the left side is a Treeview where you can toggle between Connections View and Menu View. On the right side is a Tabview that includes all connected sessions. The Connections View is used to display your available devices. When your computer is connected to an Active Directory LRD will detect this and a folder for Active Directory will be automatically added to the TreeView. Your Windows account needs read credentials on the Active Directory. The Treeview has a Context menu. To open the Context menu right click anywhere on the Treeview. 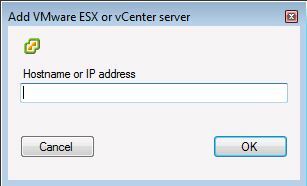 Use this menu-item to add a connection to a VMware ESXi host or vCenter server. After that you can list and find your virtual machines. Just type the hostname or IP address and click OK. The server will be added immediatly to the TreeView. The first time you open the server in the Treeview you will be asked for your credentials. 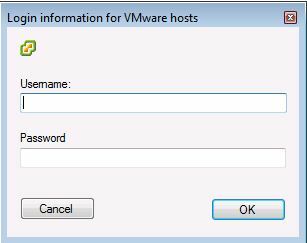 Type your username and password and click OK. You are now able to browse the VMware host for virtual machines. Your password will be remembered as long as LRD is running. Everytime LRD is restarted you will have to login again. This menu-item is only enabled when a VMware host is selected. 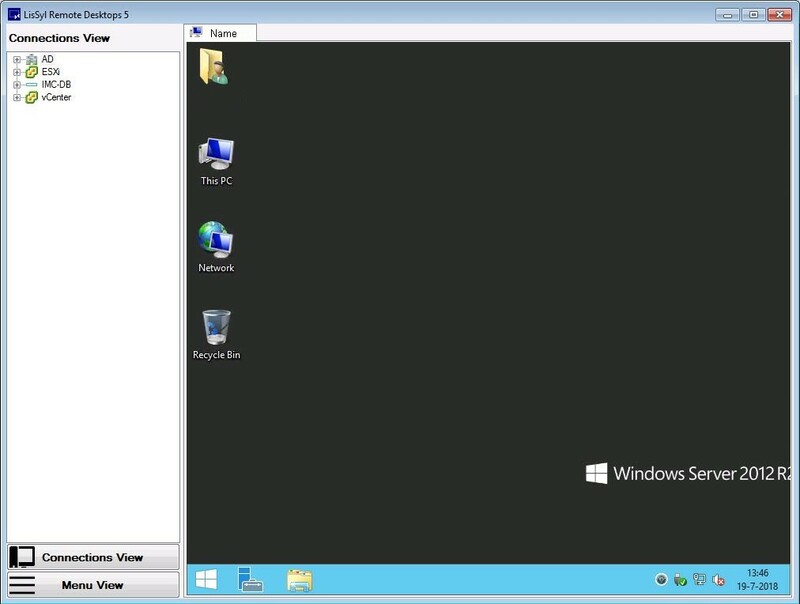 Use this item to remove the selected VMware host or vCenter server from the Treeview. Because it is very simple to add a VMware host, you will not be asked for confirmation before deletion. 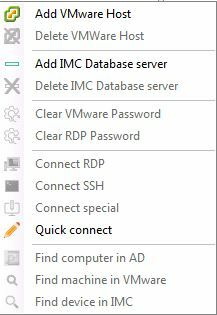 Use this menu-item to add a connection to the Database server for IMC. After that you can list and find devices that are part of IMC. Just type the hostname or IP address and click OK. The Database server connection will be added immediatly to the TreeView. To open this connection your Windows account must have read credentials on the IMC databases. 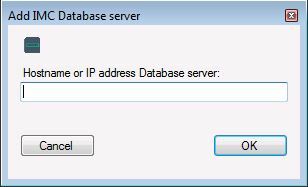 This menu-item is only enabled when a IMC Database server is selected. Use this item to remove the selected IMC Database server from the Treeview. Because it is very simple to add a IMC Database server, you will not be asked for confirmation before deletion. This menu-item is only enabled when you have entered your VMware credentials. Sometimes you’ll have different credentials on another VMware host. Use this menu-item to clear the cached VMware credentials to be able to connect with other credentials. This menu-item is only enabled when you have entered your RDP credentials. Sometimes you’ll have different credentials on another RDP computer. Use this menu-item to clear the cached RDP credentials to be able to connect with other credentials. This menu-item is only enabled when an RDP computer is selected in the Treeview. Use this menu-item to connect to the selected RDP computer. 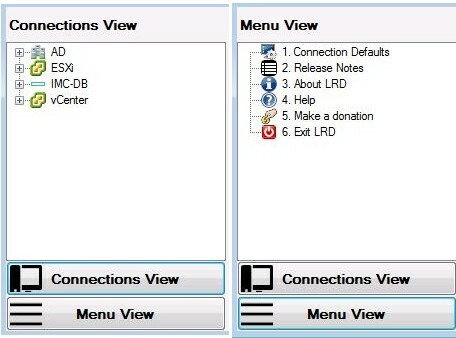 It’s also possible to double click the RDP computer to connect. The first time you connect to a RDP computer you will be asked for your credentials. Type your username and password and click OK. The RDP session will log you in with the provided credentials. 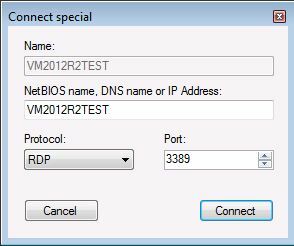 Every new RDP connections will use this credentials as long as LRD is running. Everytime LRD is restarted, or when you cleared the cached credentials, you will need to provide your credentials again. Note: When clicking Cancel, the connection will still be made. You will have to provide your credentials in the RDP session itself. 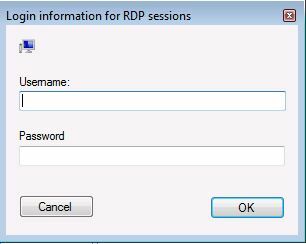 Unless you clear the RDP Password, with every new RDP connection after this you will have to provide your credentials within the session. This menu-item is only enabled when a SSH device is selected in the Treeview. Use this menu-item to connect to the selected SSH device. It’s also possible to double click the SSH device to connect. 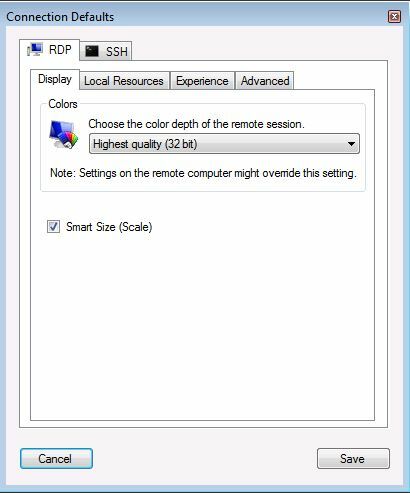 This menu-item is only enabled when a RDP or SSH device is selected in the Treeview. 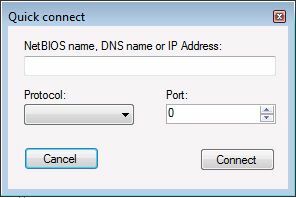 Use this menu-item to connect with alternative settings, such as IP address, protocol or port number. Type the alternative settings and click the Connect button. These settings are not saved. Everytime you want to connect with alternative settings you’ll have to enter these settings again. This menu-item can be used to connect a session by specifying the connection settings. This can be usefull when the connection is not listed in the Treeview. Type the session details (name or IP address, Protocol and Port) and click the Connect button. This menu-item is only enabled when the Active Directory root is selected in the Treeview. 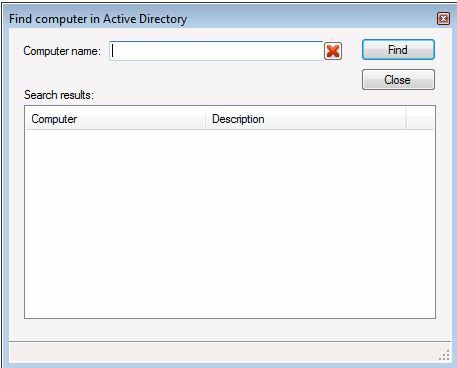 Use this option to search for known computers in the Active Directory. This way you don’t have to browse the AD tree. Type a part of the computer name and click the Find button. When the computer is found it will be listed in the Serach results. Just double click the computer to connect. This menu-item is only enabled when a VMware host is selected in the Treeview. 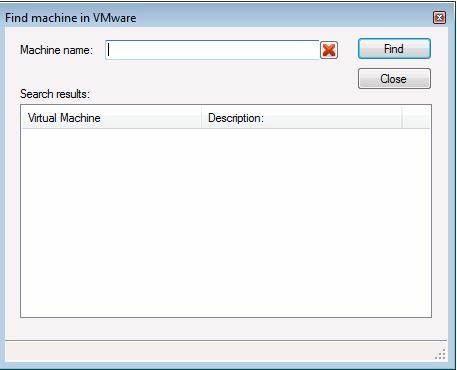 Use this option to search for known machines in VMware. This way you don’t have to browse the VMware tree. Type a part of the machine name and click the Find button. When the machine is found it will be listed in the Serach results. Just double click the machine to connect. This menu-item is only enabled when an IMC database server is selected in the Treeview. 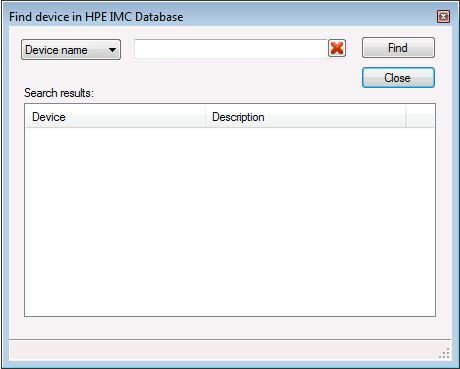 Use this option to search for known devices in HPE IMC. This way you don’t have to browse the IMC tree. Type a part of the device name and click the Find button. When the device is found it will be listed in the Serach results. Just double click the device to connect. Another option to find IMC devices is to select Device IP in the dropdown list before the search field. This way you can search for a part of the IP address. The Menu View is used to display the application menu-items. Double click an item to open it. Use this menu-item to specify connection settings which are applied to all new connections. This menu-item opens the release notes in your default text viewer. This menu-item opens the LisSyl Remote Desktops web page (this page) in your default webbrowser and scrolls to the start of the Help section. 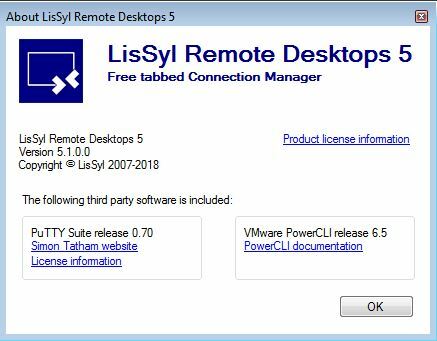 This menu-item opens the LisSyl Remote Desktops web page (this page) in your default webbrowser and scrolls to the start of the Support LisSyl Remote Desktops section. Just closes LisSYl Remote Desktops. The Tabview on the right side of the Main window shows all connected sessions. When you right click on one of the tabs a Context menu pops up. This menu has three items to close one or more tabs. Note: When you close a tab your session will not log off. The session will be disconnected and the tabpage is closed. This menu-item closes the current selected tab. This menu-item closes all Tabs. This menu-item leaves the current selected tabpage open, but closes all others. There are some shortcut keys defined in LRD. They are listed beneath. Note: These keys only work when LRD has focus. When a session within LRD has focus the key presses are handled by that session. 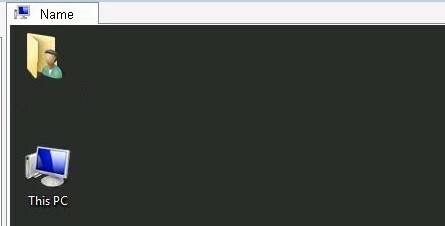 CTRL + F: Used to open one of the search forms (AD, VMware or IMC). This only works when one of the required items is selected in the Treeview. F1: Used to open the LisSyl Remote Desktops web page (this page) in your default web browser and scrolls to the start of the Help section. ALT+F4: Closes all open sessions, then shuts down LRD.